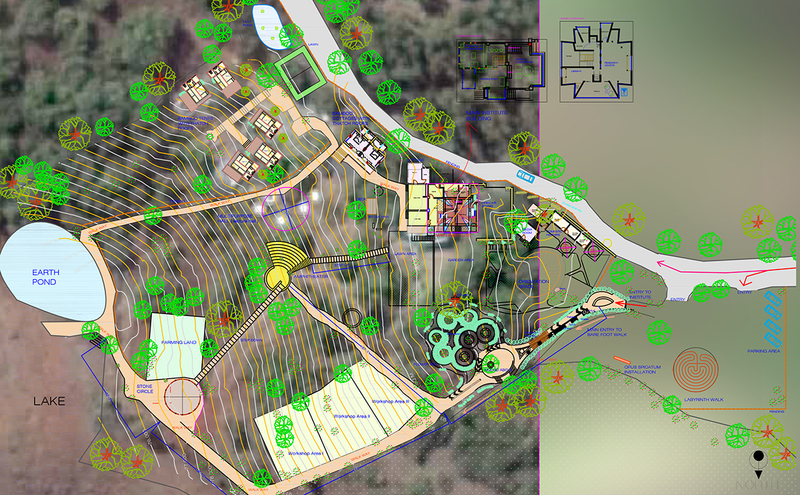 Prithwe earthing centre has residential facility with ecology and earth energies as major consideration. 3 TIMES FOOD AT EARTH KITCHEN WHERE FOOD IS COOKED IN SOLAR ENERGY. ALL OPEN AREAS ARE CHECKED & STONED FOR PROVIDING MAXIMUM EARTH ENERGIES, BAREFOOT LIVING AT ALL THE TIME IS ENCOURAGED. PRITHWE CENTRE IS PURELY LEARNING CENTRE & RESIDENTIAL FACILITY IS AVAILABLE ONLY DURING WORKSHOP DAYS. 4 OR TWIN sharing tants with attached bio- toilets has thatch roofs and stone and mud foundation act as a prefect silent retreat for learners who want to recapture after the workshop sessions. 3 Sharing Rammed earth and bamboo cottages with attached toilets are for earth connect individuals who want to feel living inside the mothers earth. This feelings is amazing and extra ordinary. Both tents and cottages are over looking the vast expanse of Yelwanti river in east slope of the property. Prithwe earthing centre is a perfect learning retreat for people who wants to connect with nature and listen or native sound of Mother Earth. Western Ghats, Rajgadh fort, Sahyadri mountain ranges are encompassing this centre as protective arms. We believe in eco-living, thus this retreat would have good home made food , vegetables and fruits which are mostly grown in or nearby farms. We reuse all water used for bath & washing to irrigate our vegetation & also recharge the earth. we request all to use natural non toxic soaps and washing powder provided at the centre & avoid chemical soaps & shampoo. Self help and voluntary service to human and nature is expected at Prithwe, thus we would appreciate if we help each other in managing the rooms and services.